Easily clean even the dirtiest of wheels! The P&S Brake Buster Non Acid Wheel Cleaner helps you safely and easily clean your wheels. You will be amazed at how quickly this product removes brake dust, road grime, light grease, and dirt from clear coated, factory painted, chrome and other delicate wheel surfaces. Simply spray the wheel down with cool water, spray the Brake Buster onto the surface, and rinse it off, it is that easy! The unique gel formula clings to the surface, breaking down contamination for safe removal. For heavily contaminated wheels allow the product to dwell for and agitate with a wheel brush. Once you are finished you will not only be left with a clean wheel, but a protected one as well. Brake Buster contains corrosion inhibitors that deposit a thin layer of protection on the wheel to protect from future corrosion. Pick up the Brake Buster Non Acid Wheel Cleaner and make quick work of dirty wheels today! Safely removes accumulated brake dust, oil, dirt, stains and light corrosion from premium quality wheels without damaging** the delicate surface. 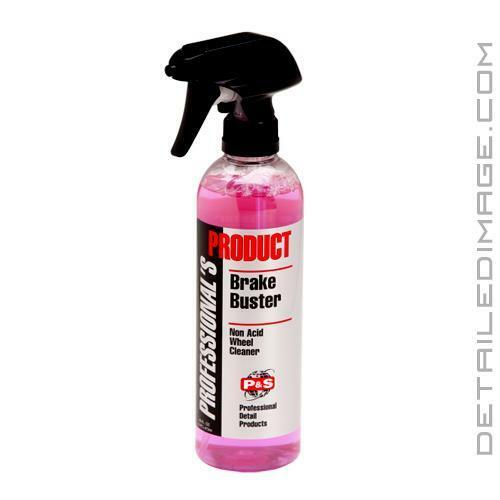 Brake Buster is a unique cleaner that adheres to the wheel surface and penetrates the dirt deposits to clean them away. Brake Buster deposits a thin layer of special corrosion inhibitors to protect the wheel from future corrosion. Allow to stand for one minute or greater. **Important: Spot on all wheel surfaces prior to application to avoid the possible risk of staining or damage. Try it diluted 5:1 in a IK foam sprayer. Let it dwell about 4 mins. Great cleaner for both wheels and tires !